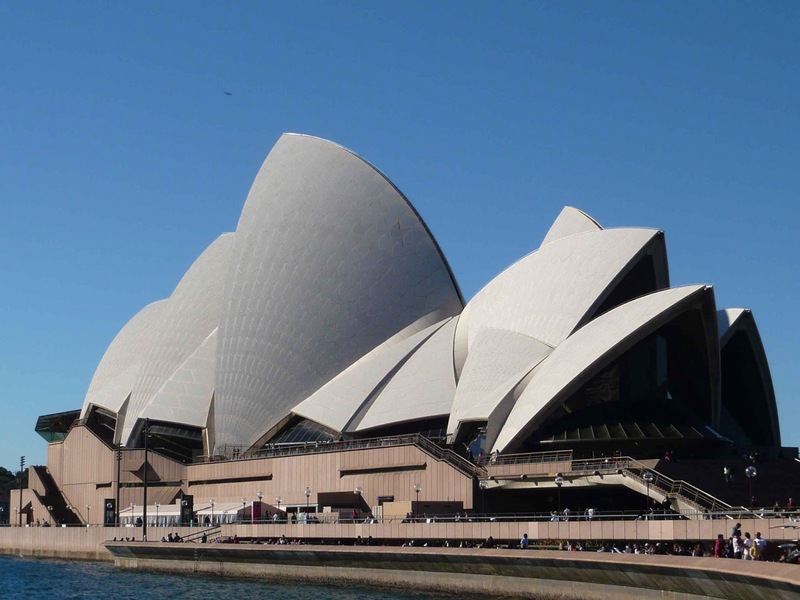 The Sydney Opera House in New South Wales, Australia, is an impressive hulk. 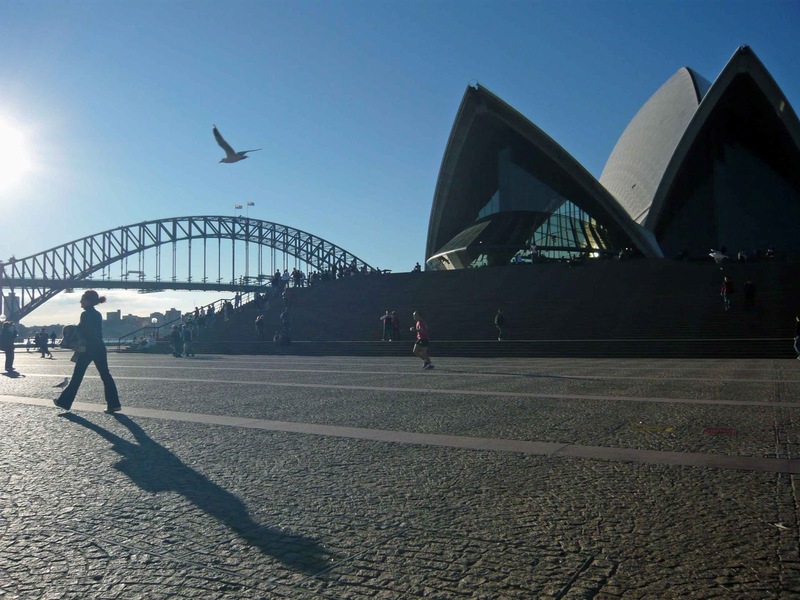 With over 7 million visitors each year, it provides a venue not just for opera – as its name suggests – but also ballet, symphonies and theatre companies. A magnificent structure, and known the world over as a great architectural wonder. Yet there's a sad history hidden beneath its glossy tiles. The mind behind the design is Copenhagen born Jon Utzon, and was inspired by the simple act of peeling an orange: the 14 shells of the building, if combined, would form a perfect sphere. From 1937 he studied architecture at the Royal Danish Academy of Fine Arts, and in 1957 entered a competition to design the Opera House. He unexpectedly won despite the fact that it was his first non-domestic design and his entry did not meet the contest criteria; his submissions were little more than preliminary drawings. One of the Judges described it as genius, and so began the foundations – literally – to a magnificent piece of art. 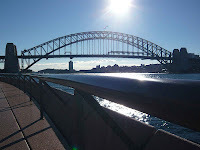 Halfway through its construction, in 1965, escalating costs of the project led to the Minister of Public Works ceasing payments to Utzon, forcing him to resign as chief architect in 1966. He secretly left the country days later. According to sources, the entire project resulted in a cost overrun of 1,400 per cent. In March 2003 – thirty years after its opening – Utzon was awarded an honorary doctorate by the University of Sydney for his work on the Opera House, despite the controversy surrounding its early construction. On his behalf, Utzon's son, Jan, accepted the award as the architect himself was too ill to travel to Australia. Utzon was also made a Companion of the Order of Australia (AC) and given the Keys to the City of Sydney (this was back in 1985). He was then involved in redesigning areas of the Opera House, particularly the Reception Hall, and later in 2003 he received the Pritzker Prize – Architecture's highest honour, considered to be one of the world's premier architecture prizes and is often referred to as the Nobel Prize of architecture. In March 2006, Queen Elizabeth II opened the western colonnade addition to the building. At the opening ceremony his son took his place, saying his father "is too old by now to take the long flight to Australia. 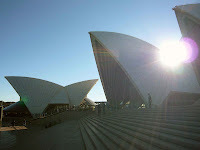 But he lives and breathes the Opera House, and as its creator he just has to close his eyes to see it." 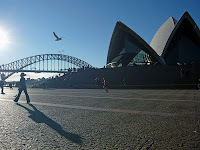 At the age of 90, following a series of operations, Utzon died of a heart attack, having never returned to Australia after his swift exit in 1966. He never saw his complete works. The roofs of the House are covered with 1,056,006 glossy white and matte cream tiles. Swedish-made, and despite their self-cleaning nature, they still have to be suitably maintained and replaced occasionally. The building contains 150 tons of concrete, takes a height of 67 metres (221 feet), a width of 182 metres (597 feet), and sports 20,245 metres (66,420 feet) of glass! Covering 1.8 hectares (4.5 acres) of land, it is 183 metres (605 feet) long and about 120 metres (388 feet) wide at its widest point. It is supported on 588 concrete piers sunk up to 25 metres (82 feet) below sea level, and its power supply is equivalent to that of a town with a population of 25,000. All photographs are my own, taken from my travels in 2008.